Titan Poker online poker room, which can be found within the iPoker Gaming Network and if strongly argued to be the biggest European online poker room in the industry. This is largely due to the promotions like this one and the great Titan Poker Bonus you can get by downloading Titan Poker. The French based poker room has rolled out a number of satellite tournaments for its top players to battle it out within in order to try to win one of a number of World Series of Poker packages that are valued at $13,000. Making their bold statement within the online poker industry, the poker room hasn’t simply stopped there, adding in further ways that players are able to win entry into the $10,000 buy in tournament which will be staged in Las Vegas. The second way that the poker room has devised to offer packages for players to try to win is in the form of a Sit and Go jackpot offer which will see online poker players battle their way through specific Sit and Go poker tournament that have been specially created for the promotion. Players have to compete with a number of others in a bid to win six Sit and Go tournaments in a row in order to qualify for the special packages on offer, packages that dwarf the $13,000 packages already on offer at the site. The Sit and Go jackpot prizes consist of a World Series of Poker Main Event package that carries a value of $25,000 and includes everything from entry into the Main Event tournament as well as hotel accommodation, spending money and limousine travel to the tournament venue in Las Vegas. 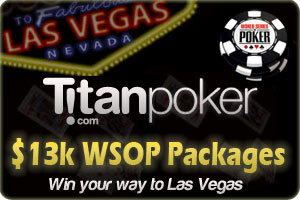 A quick glance at the World Series of Poker tournaments on offer at Titan Poker reveal that you can buy into the satellite tournaments for as little as $0.96, so there is no limit to the types of players who will get the chance to strut their stuff alongside some of the biggest names in poker. This entry was posted on Friday, May 7th, 2010 at 8:15 am and is filed under Poker Promotions. You can follow any responses to this entry through the RSS 2.0 feed. You can leave a response, or trackback from your own site.